Hi friends! Today I’m excited to share with you where we ate, drank, explored & stayed in Vancouver, Canada. This was our first time in Canada and we loved every minute of it! 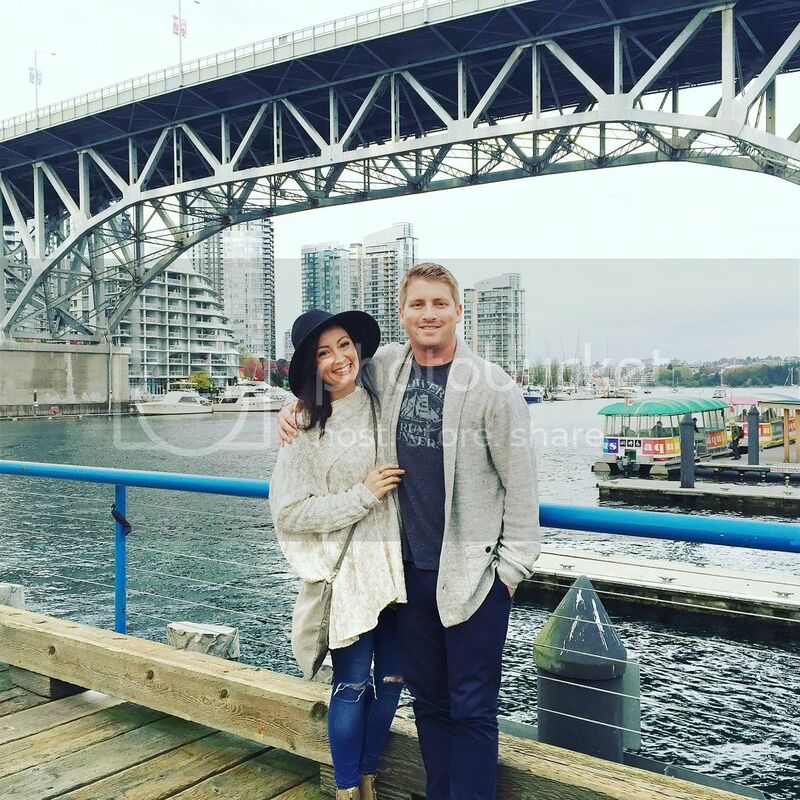 We stayed at the Delta Vancouver Suites located on West Hastings street – about an 8 minute walk from Gastown and a 7 minute walk to the waterfront / Canada Place. Gastown was one of my favorite parts about Vancouver! Such cute streets, lined with Paris-like street lights with endless amazing food & drink stops. 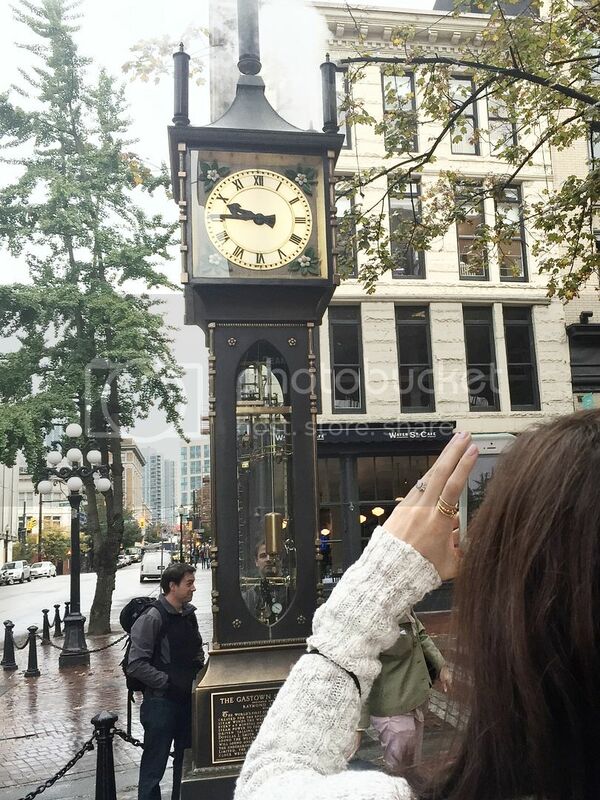 There is also the historic Gastown clock which is a working steam clock that whistles and shoots steam every quarter hour. It’s a beauty! 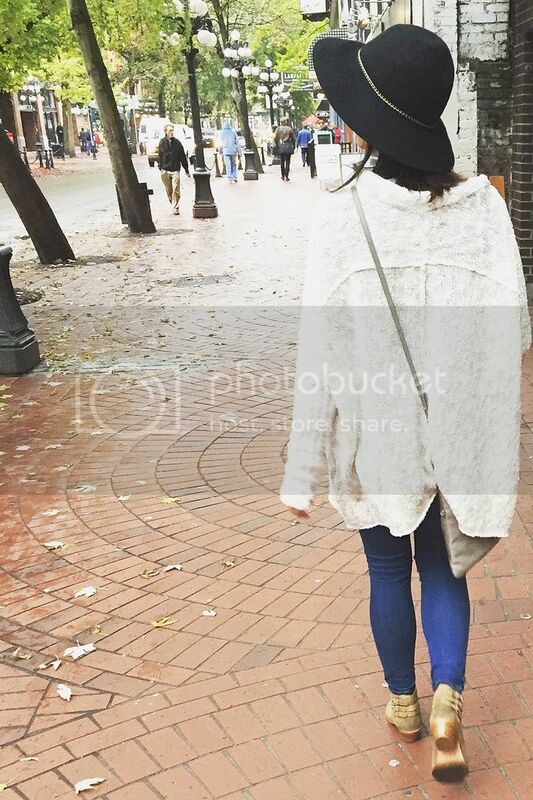 We were able to walk everywhere from our hotel and I highly recommend staying in Gastown or close to it. 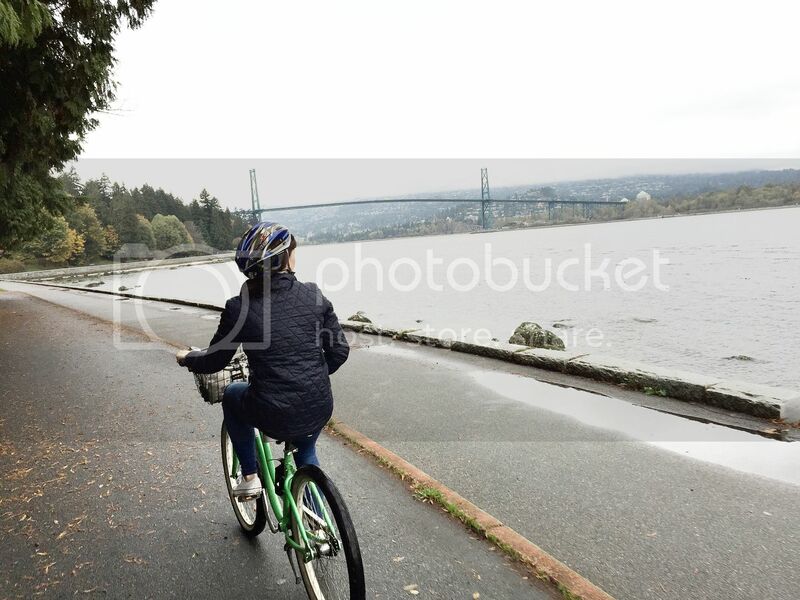 Stanley Park :Stanley Park is one of the prettiest locations I’ve ever been to in my life. It is just one scene of gorgeousness after another. Bryan & I rented bikes from across the street at Spokes Bicycle rentals and rode along the Stanley Park Vancouver seawall. (It probably took us about 1.5-2 hours) The leaves were the greatest shades of fall and the scenery was just perfection. I kept reminding myself while riding to never forget the beauty of that exact moment. 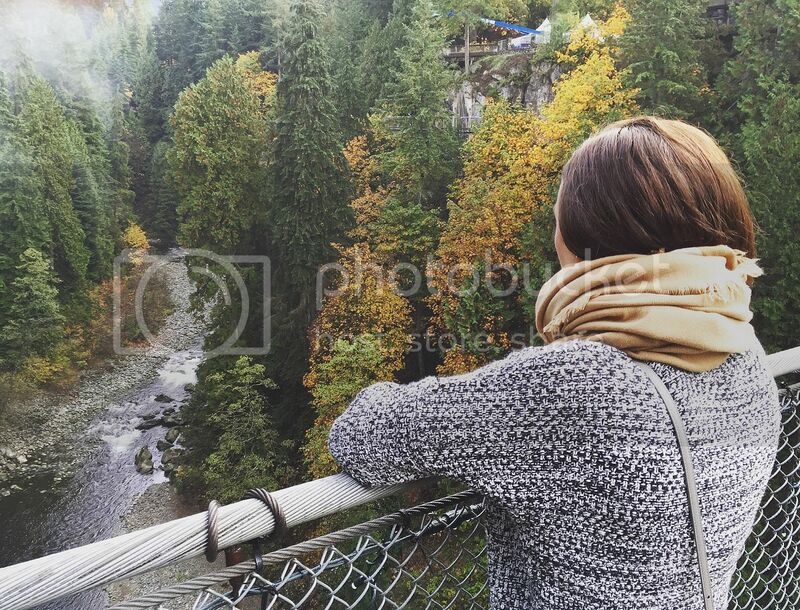 Capilano Suspension Bridge Park :The Capilano Suspension Bridge Park was a great attraction for breathtaking Canada views. 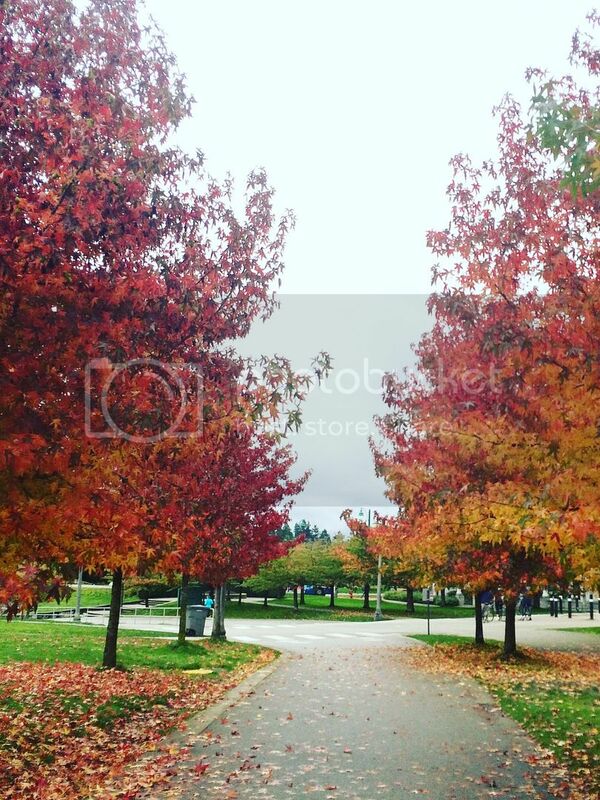 There is a shuttle that picks you up from downtown Vancouver and takes you to the park. It took us about an hour to walk around the park and take in the gorgeous scenery. 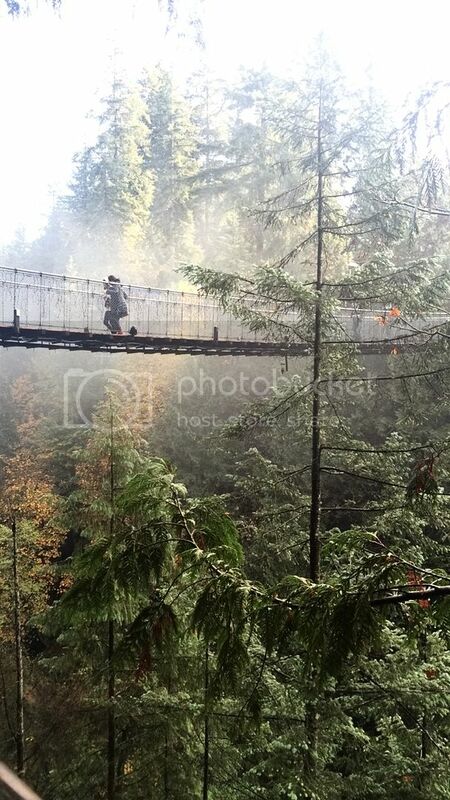 The suspension bridge is 460 feet long and a very neat experience! 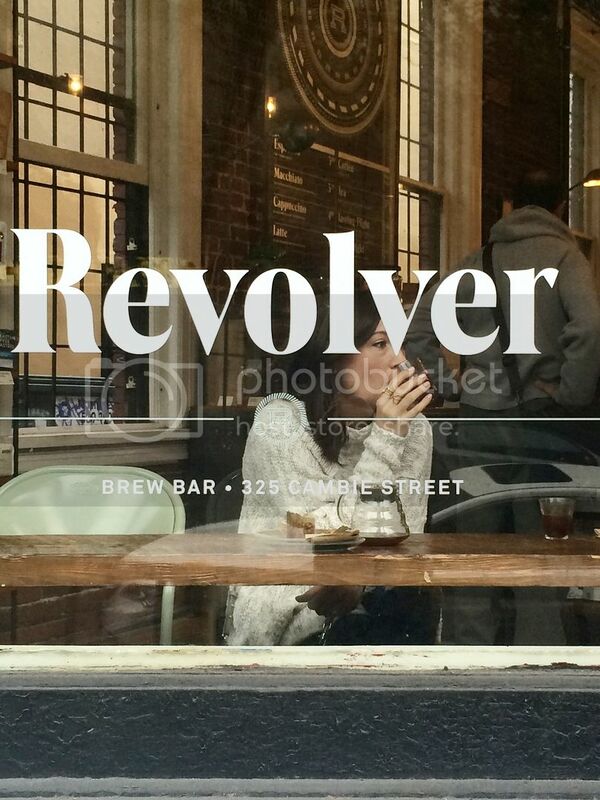 Revolver Cafe: Bryan & I stumbled upon this little cafe on our first day in Vancouver. 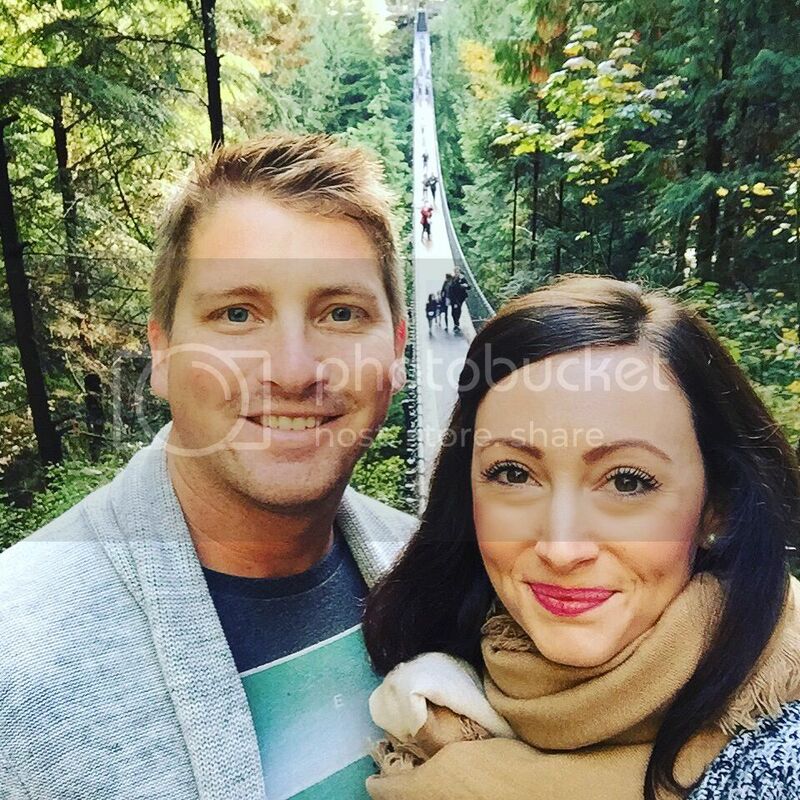 We were there a total of 3 times in 2.5 days…..that’s how much we loved this coffee shop! 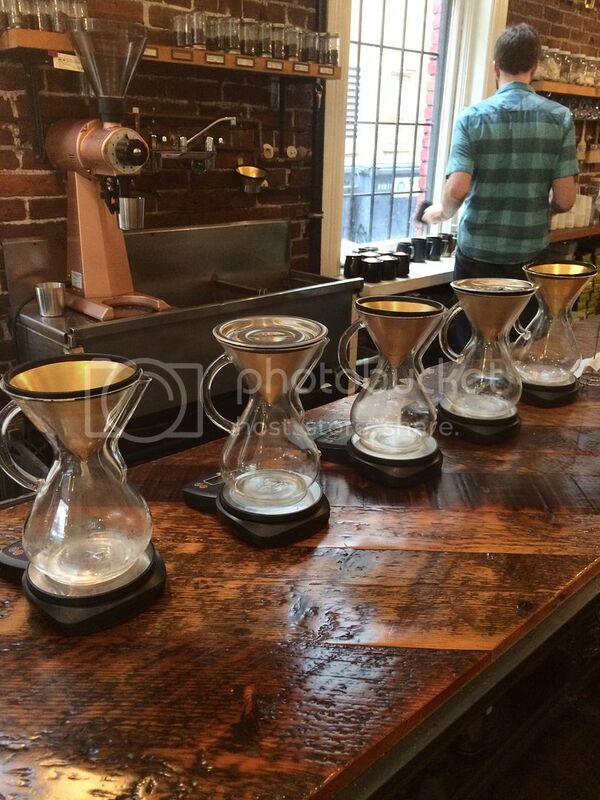 Not only was the fresh-pour over coffee to die for, but the atmosphere of the cafe was ideal. Small little booths lined the left side of the cafe and there was even another small room next door to seat more guests. The guys there know everything about fair-traded coffee and it’s just plain DELICIOUS. If you appreciate a good tasteful coffee, this place cannot be missed. The Flying Pig: Yum! Yum! Yum! Talk about good food. We loved this place. What we loved even more was the “Jumbo Short rib Mac”. Yes, you read that right- Short rib mac & cheese. It was DELICIOUS. I mean, probably one of my favorite foods from traveling so far. And to be honest, we ate it twice. Once when we first got there and a second time before we hopped on our flight back home. Cute atmosphere, delicious food and a great place for happy hour or as they call it, ‘Appy Hour. 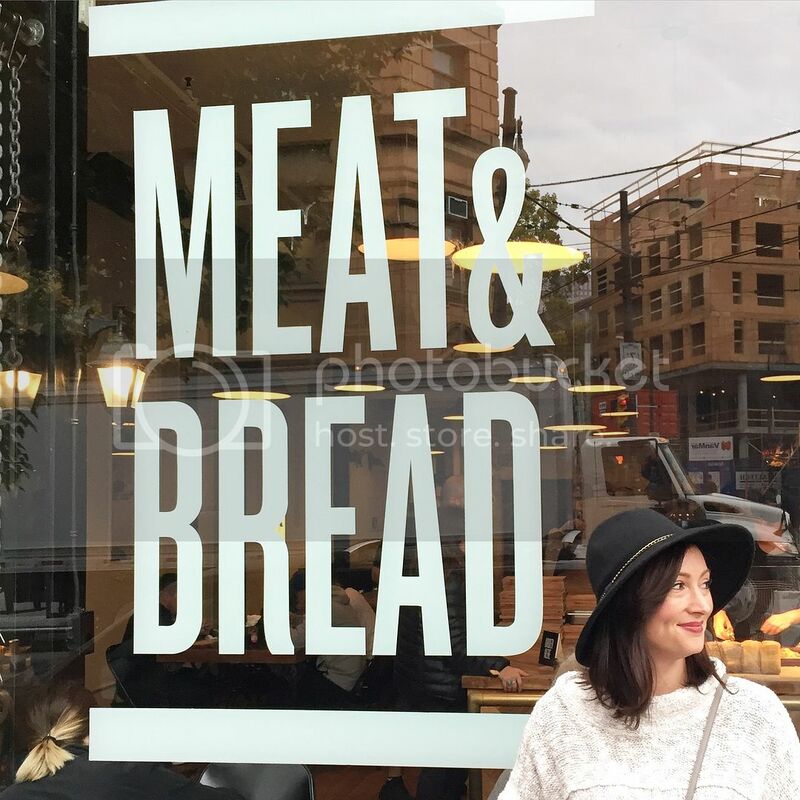 Meat & Bread : What a wonderful place for lunch. Such a small cute little place that offers a tiny menu but every sandwich on it looks so tasty! They make your sandwich in front of you, place it on a cute wooden board & you can order small glasses of wine to go with it! Pourhouse Restaurant : This was our first dinner location & what a perfect one! It had a great city vibe, a wonderful menu (where we wanted everything! – always a good sign), & big delicious glasses of wine. The “Scotch Egg” was fantastic! 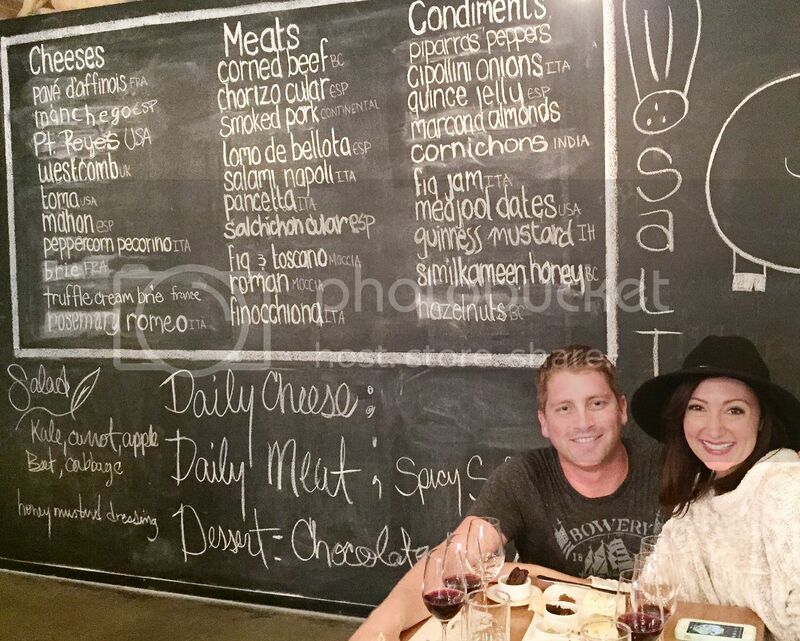 The Salt Tasting Room : What a fun experience! The restaurant itself is picture perfect, all of the wines pair fantastically with the food and the presentation is definitely Instagram approved. There is a huge chalkboard in the back of the restaurant that lists all of the options for you. You can choose 3 items total from the meat & cheese section, 3 condiments and then your choice of 3 wines. Everything was delicious! L’Abattoir : Loved this place! What a BEAUTIFUL atmosphere and some of the BEST craft cocktails I’ve ever had! Each drink was beautifully prepared, with such great flavor. We didn’t eat here, just stopped in for drinks but let me tell you, everybody else’s food looked pretty amazing! If you are thinking about visiting Vancouver, definitely put this down as a place to stop in for a drink. Don’t miss it. 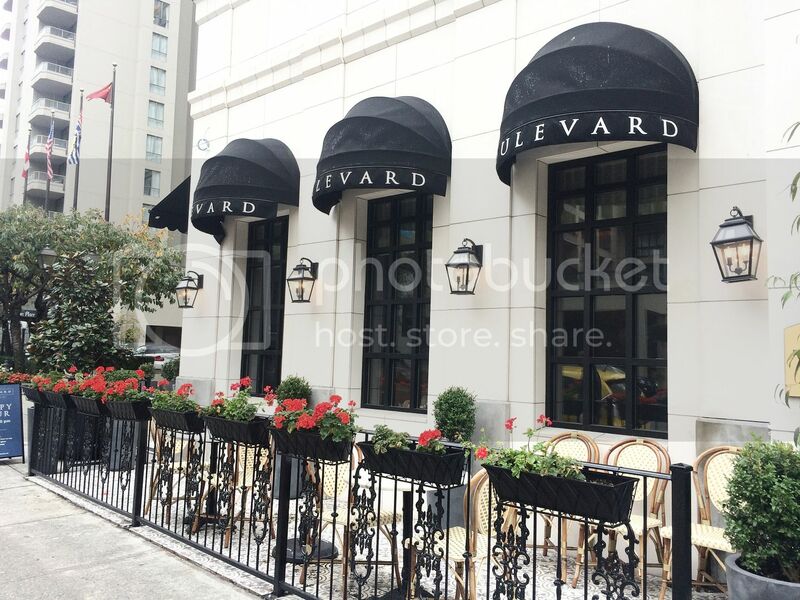 Boulevard Kitchen & Oyster Bar : If you like oysters, this is a must stop for you. We stopped here for oysters & a glass of champagne after we biked Stanley Park. Talk about feeling fancy! The oysters were SO fresh & paired perfectly with the bubbles. Did I mention that the outside of the restaurant is the cutest? Gringo : This place might be small, but its FULL of flare and fun. Gringo is a inexpensive taco bar down a small alley way in Gastown full of bright colors and very interesting drinks. My drink came with a gummy worm in it – so fun, different and good! We were just going to stop in for a drink but when we found out how inexpensive the tacos were, we just had to try them. AND so happy we did! Delish! Warning: we did have to wait outside for a little bit because it is very small/crowded. But we were so glad we waited. Quite the experience! Water St. Cafe : This was our choice for dinner on our second night in Vancouver. Located right in Gastown under the cute little street lights lies this charming and cozy restaurant. We sat at a table by the window where we enjoyed huge bowls of pasta and wonderful wine. 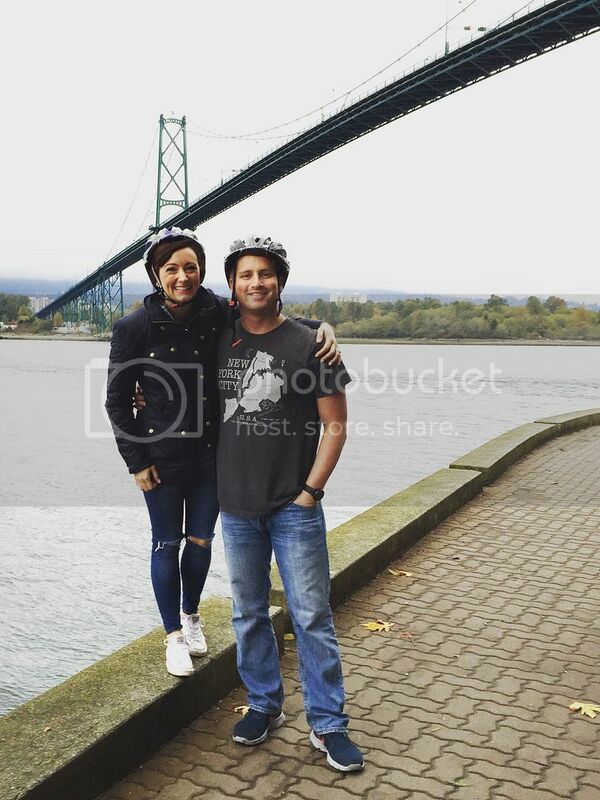 It has such a romantic setting and is considered a Vancouver landmark since 1988. The Lamplighter Public House : If you are looking for a pub-like place to enjoy a beer and watch a game, this is the place to do it. What I liked best about it though was that the food, atmosphere and drink were really good, not like some pub food I’ve experienced. We had brunch here on our last day in Vancouver and they had a HUGE and impressive “build your own Caesar” bar (Very similar to our Blood Marys). This is a good place to take your guy for a Vancouver style beer and a little sports watching. Overall Vancouver was full of some of the best food and drink I’ve ever had. I would say you could definitely do the city in 2-3 days & make sure you come hungry!